Technical analysis is a rather posh name for a very simple concept in trading. It is basically the study of charts on a computer to determine the best areas to invest in a tradable financial instrument, whether it be stocks (e.g. Google, Facebook or Apple), the Forex or currency market (e.g. USD, EUR or GBP) or commodities (e.g. gold, silver or oil). The charts are made up of price movements which comes through as a live data feed over the internet. Traders can see both what has happened in the past and also what is happening in real time, and can choose to see the data on the time frame suited to their trading style. A scalper may use, say, a 1-minute or a 5-minute chart, a day trader may use a 1-hour chart, and a long-term trader would use the daily and the weekly chart. Going back hundreds of years, technical analysis is the oldest method designed to take on and beat the market. Early signs of technical analysis can be traced as far back as the 17th century. However, following the seminal articles written by the father of modern technical analysis, Charles H. Dow in the Wall Street Journal between 1900 and 1902 and also books, such as those written by Robert D. Edwards and John Magee in 1948 when the basic concepts of technical analysis really became popular. Since then, a complete jargon of pictures and phrases have been developed which traders base their buying and selling decisions on. From its roots, we can see that technical analysis was used to analyse charts on paper but in recent times it has been transferred to the computer. The most common chart used is the candlestick chart. Imagine an ordinary candle but with a wick coming out at both ends. Now imagine hundreds of candlesticks across the screen of your computer all of different wick length (but equal width) and all with different sized bodies and you will get an idea of what a trading chart looks like (see below). 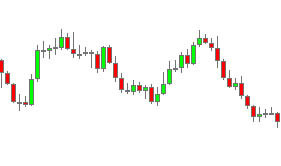 If we are looking at the daily chart, then each candlestick represents price action per day. The opening and closing price are represented by the high and low of the body (the wax) of the candle. The range of price action for the whole day is represented by the high and low of the candle wick. If the bar is coloured green, it was a day controlled by the buyers with the closing price being above the opening price.If the bar is red, the reverse is true: the day was controlled by the sellers, with the closing price being below the opening price (see right). The closing price of the previous day is the opening price for the next day. The size of the bar represents the amount of trading done on that day; the bigger the bar the more volume or trading on that given day. These variables hold true for each candle on any time frame whether it be candles produced on a 1-minute chart or a monthly chart. For example, a candle produced every minute on a 1-minute chart has a body with an opening and closing price and a wick that represents the range of price action for that moment. And there you have it, the candlestick, the basic building block of technical analysis. How are these candles produced? Ask any novice trader what moves the market and they would give the answer based on what the media pumps out at us; wars, natural disasters, banks misbehaving, political issues etc. In reality it is the reaction to this news that moves the market, the human emotions of millions maybe billions of traders trying to predict whether the value of a particular financial instrument is going to go up or down. The shorter the time frame, the more volatile the movement, and the more aggressive and non-sensical the formation of the candles look. This random nature of movement , say on a 1-minute chart, is where most traders look to trade and get rich quick but where 95%, called the Dumb Money, fail and walk away empty-handed. Is price the only variable involved in technical analysis? For the Smart Money, price is the main variable, or “indicator” in trading jargon. These candlesticks group together over the long term to make patterns. The long-term pattern of choice for a top trader is called a trend. This is when the market is moving up and a trader buys, or when the market is moving down and a trader sells. A market is considered in a range when it is moving sideways, and this is where a trader should stand aside and refrain from trading. A top trader knows that standing aside is also a position, as knowing when not to risk your money is a key element to trading. Chart patterns such as “double tops,” where candlesticks have formed an “M” shape (see left), and “flags” where price has moved in one direction with several big bars and then moved in the opposite direction for a few small bars, looking just like a flag, are typical patterns that a trader looks to enter the market based purely on price. Support lines, areas where price has repeatedly bounced up from, or resistance lines, where price has repeatedly rebounded down from, are another good price-based indicator. In addition, there are a handful of other secondary indicators that can be used to add weight to your decision of entry. To elaborate, I have found an area to open a trade which I consider a high-probability setup based purely on price set-up. I can then use secondary indicators such as Moving Averages, MACD, Fibonacci, to name a few, to add confirmation to my decision and give me that little bit more confidence that I am entering the market in the correct area. The use of different combinations of these variables to open a trade is called a strategy. A top trader has several simple yet highly-effective strategies to use in varying market conditions. The mistake that novice traders make is to forget that price action should always be the main indicator; instead they become fixated on all the other indicators. They clutter their charts with all that is available to them, turning what should be a simple chart into chaos on a computer screen. In reality, a top trader is able to make decisions purely based on price action without the need for any secondary indicators.